I enjoy sharing thoughts and opinions via the media. Scroll down for articles where I've been quoted. I am happy to discuss content strategy, social media or marketing strategy in general with the press or other media outlets. Call or email to chat with me on the record or just for background. 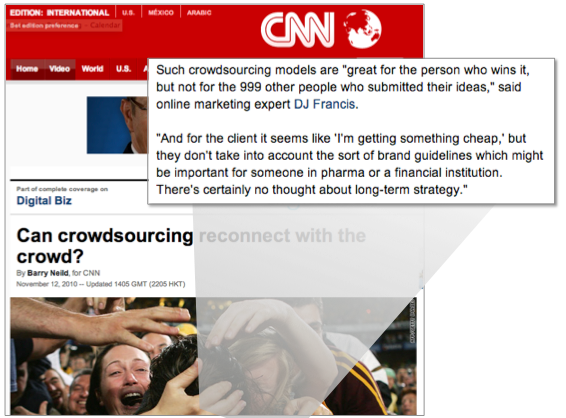 CNN asked me about the viability of a crowdsouring business model on the larger marketing community. I can see it working on occasion, but I do not believe it can exist as the sole model for a business and certainly has a negative impact on the individual designers or writers contributing their work. I gave some advice to OG Content about ecommerce and the user journey. Then Referral Candy created a handy little infographic based on that post. I was interviewed on content strategy, customer service, advertising and purpose marketing for Orange Magazine, a publication of my employer, Imagination. Bob Garfield and I were the main commentators, so at least I was in good company. I act as a commentator or blogger across many prominent online properties, including MarketingProfs, iMediaConnection, ReadWriteWeb and others.